Improving the male-to-female ratio in the technology industry emerged as a big theme at South by Southwest this year—especially after a panel in which a prominent female executive, United States CTO Megan Smith, found herself repeatedly interrupted by Google executive chairman (and former CEO) Eric Schmidt. The session, titled “How Innovation Happens,” also included Aspen Institute CEO and author Walter Isaacson, perhaps most famous for his controversial biography of Apple co-founder Steve Jobs. The event was advertised as a “conversation” about how companies such as Google transform great ideas into innovative technologies, as well as how lack of diversity holds companies back. 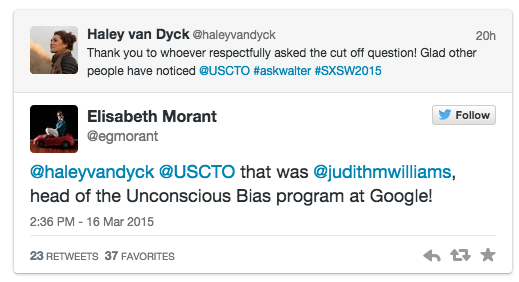 According to Twitter, the person calling them out may have been Judith Williams, head of the unconscious bias program at Google. The crowd applauded. As one man pointed out after the session, Smith was once Schmidt’s subordinate, which could have introduced an additional element into play beyond the typical dynamics of women and men in the workplace. But being higher on the org chart doesn’t excuse certain types of behavior. This year’s South by Southwest will host a number of panels on diversity, but how many of those will provide such a clear example of the issues at hand? You know as a recently discriminated against person I been dealing with this crap all my life weather it be over the tone of my skin or the fact that I’m handicapp. Seems to me yall ain’t never going to get it right no matter which way yall turn. Same crap different day and a damn dollar bill short. I wonder how many black people were there? Good god, we need to pass a bunch of laws and turn the tort lawyers loose on these companies. Once we’re done with IT, it’s time to even up the gender gap in nursing.